Whether you prefer your country suited and booted or tattooed and bearded (not necessarily on the same person), the Arena line-up at Sunday’s C2C had something for everyone. That is of course, unless you enjoy a lighter dose of ‘country pop’ a la some of the weekend’s earlier participants. 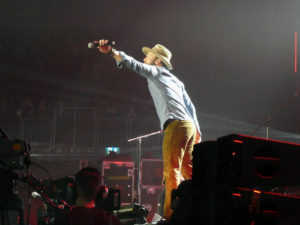 First on stage and bringing his own touch of soul to the evening was Drake White, showcasing his new-look Big Fire band in the UK for the first time. Fresh from a hectic afternoon, which included a personal appearance at the UK’s first Firestarter Family Gathering (his fan club for those that don’t know) hosted by Six Shooter Country; and then the press conference; his energy and enthusiasm are sure to have brought him new fans as well as delighting his older ones. Cracking off with a great version of ‘Ride Sally Ride’, White told the crowd: “It’s good to see you London, we appreciate each and every one of your heartbeats” – before launching into signature song ‘Heartbeat’. Promising to help everyone “disconnect” for the evening, he said it was his job to “make memories – something we can all take home and live with” and he certainly made plenty of those. Familiar tracks ‘Story’, the ‘Coast is Clear’, and ‘Making Me Look Good Again’ got the crowd going and Queen favourite ‘Fat Bottomed Girls’ proved a high-energy finale. The mistress of 2018 proved she was no flash in the pan. Tattooed (not bearded) Ashley McBryde burst onto the main stage with ‘Living Next to Leroy’ and then ‘El Dorado’, instantly getting the audience on-side as she gave them a flavour of the stories behind the words. ‘American Scandal’ is always a personal favourite, invoking as it does, memories of Kennedy and Monroe, and showcasing her amazing voice. 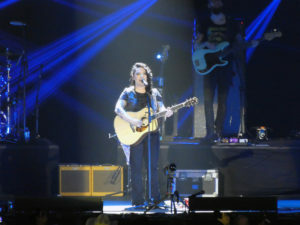 Fellow favourites ‘Fat and Famous’ and then ‘Girl Going Nowhere’, the title track of her current album, were accompanied by the words: “don’t let me hear that you gave up on your dreams”. The beautiful ‘A Little Dive Bar in Dahlonega’ kept the crowd happy before far too soon, it was time for Tired of Being Happy, the song she signed off with. I think it will be a long time before she gets to that stage in her life, and hopefully a lot sooner that we see her back on the C2C stage. I’m thinking she’s the artist who took my own number one slot for the second year in a row. Don’t forget to check out her UK tour later this year. Flashback to last October, and I was in the audience at the CMA Songwriters Series event at Shepherd’s Bush Empire, when the name Lyle Lovett was unveiled for the 2019 Legends slot. In the following days, the C2C Attendees page lit up with ‘who, what, where’ as plenty of people scrambled to acquaint themselves with this quiet Texan singer songwriter, possibly best known outside the US for his marriage (and subsequent divorce) to Julia Roberts. For me, his 1987 album Pontiac was the perfect roadsong, hours of happy listening to the clever words of ‘If I Had a Boat’, ‘She’s Hot to Go’, and ‘I Loved You Yesterday’, and I was fortunate enough to see him at both the Royal Festival Hall and the Barbican over the following years. Quite how he would go down with the C2C crowd, I wasn’t so sure. Would he do a ‘Marty Stuart’ or leave them cold and bored? As it was, Lovett and his Quasi-Cowboy Band – aka the rhythm section of his Large Band – did himself proud. True, it wasn’t to everyone’s taste (bit too bluesy, bit too jazzy were maybe the most oft-heard comments) but you could tell, as the audience got into his unique style and really listened to the music, they began to realise that this was someone really deserving of that legend slot. This article opened with a comment about ‘suited and booted’ and Lovett and his band stood out from the crowd with their smart ties, suits and even a flat cap or two for good measure. In a gig filled with beautiful harmonies, great fiddle playing, and check out the double bass, Lovett talked about growing up in Texas, where everyone grows up to be a cowboy – except he didn’t. Declaring himself afraid of cows (cue plenty of laughs), his words led into growing up to be what you want to be – and a stunning rendition of ‘If I Had A Boat’. Blues singer Francine Green joined the band to show off her amazing vocals on several numbers, almost bringing the house down with Here I Am. Giving his back catalogue free rein, the music ranged from ‘Cute As A Bug’ from his 2003 album’ My Baby Don’t Tolerate’, to ‘Church (Beans and Cornbread)’,from 1992’s Joshua Judges Ruth, and several others for good measure – including ‘Pants Is Overrated’ before finishing with a tribute to his own personal hero, Townes van Zandt. 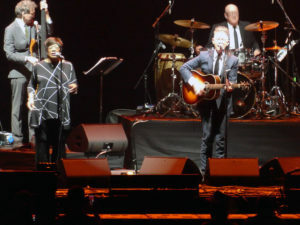 Compared to the rest of the line-up that night, Lyle Lovett and his band might have looked as if they were on their way to a wedding, but they certainly delivered the gift of great music and precious memories. 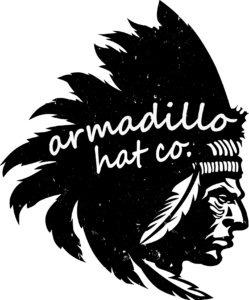 Before we finally come to the bearded contribution of the night – and what a beard – a shout-out too, to Spotlight stage artists Caroline Jones, The Wandering Hearts and Jimmie Allen – no doubt we’ll be seeing plenty more of them in years to come. 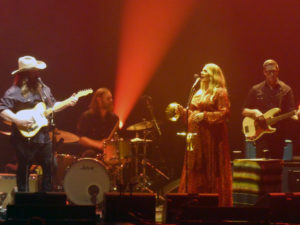 There was no doubting the grand finale however, as a raucous loud crowd welcomed Chris Stapleton and his heavily-pregnant wife Morgane. The kingmakers of 2016 could not have contrasted more spectacularly with the previous act, offering a loud and rock-driven start which got the crowd cheering and hollering on their feet. ‘Nobody to Blame’ showed off both his voice and some incredible instrumentals, while ‘Fire Away’ was the perfect vehicle for his rich and honeycombed voice. ‘Might As Well Get Stoned’ literally made his guitar talk and was followed by ‘Nobody’s Lonely Tonight’. Then it was stripped down to just Chris and Morgane for acoustic versions of ‘Whiskey and You’ and ‘Either Way’. You could hear a pin drop and it was like intruding on the most precious of duets between a man and his wife. Indeed, that was the theme of the evening, Stapleton is apparently very shy – he didn’t appear at the press conference – and spent almost the entire set focused on his music and his wife. The lights going down between each song was slightly disconcerting for the audience and for a headliner I personally would have liked a bit more banter and interaction, that aside, you couldn’t fault his music. Favourites ‘Broken Halos’, ‘Traveller’ – the song he admitted had started it for them – and ‘Parachute’ proved the ultimate crowd pleasers and there was a touching moment towards the end when he gently sang the introduction to each of his band members and his “lovely, lovely, lovely” wife. Declaring it to be “time to drink some whisky” he launched into the penultimate – and best ever song – Tennessee Whiskey, to be cheered off stage and return for just one last masterpiece, ‘Sometimes I Cry’.